An interactive Web video based on the renowned documentary WaterLife and an iPhone application showcasing Canadian films earned Canada’s National Film Board (NFB) five Webby Award nominations. While winners will be announced May 4, on June 14 the 14th Annual Webby Awards event will be held in New York City. It will honour producers and creators of outstanding online content, including, blogs, Web sites, Web TV shows, interactive advertising, online films, online video and mobile Web sites. This year the National Film Board joins Internet and pop culture superstars Twitter, Hulu, foursquare and Mashable in the list of nominees. Leading the way, the Waterlife Interactive Web site was nominated in three categories – Society/Education, Society/Green, and Media/Movie and Film. It was also nominated for Best Online Film and Video in the Documentary: Individual Episode category. Produced by NFB and designed by Jam3Media, a Toronto-based Web design and marketing firm, Waterlife Interactive is based on the award-winning documentary WaterLife directed by Kevin McMahon. 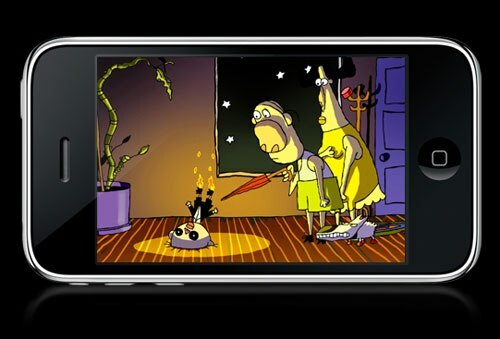 The NFB’s free iPhone App was nominated in the Mobile category for Best Use of Mobile Video – Mobile Web Features. 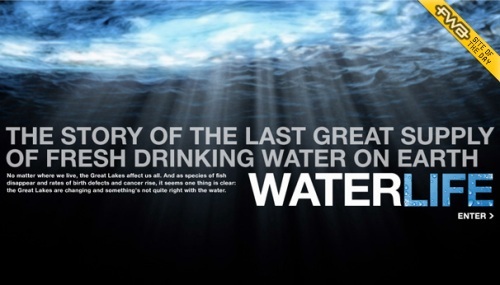 McMahon’s documentary tells the story of the Great Lakes, their bounty, and how they were contaminated by humans. It traces the journey of water from the Nipigon River to the Atlantic Ocean. The NFB, which co-produced the film, sought to extend its awesome cinematic experience via the Web to audiences that weren’t able to watch the movie, according to Rob McLaughlin, director general of digital content for the film board. “We wanted to provide online audiences an experience that was by itself creative and educational,” he told ITBusiness.ca. NFB and Jam3Media worked on the project in November 2008 and launched the site last June. The Toronto Web design firm used Papervision 3D a Flash-based design engine that was then very new. The technology enabled developers to create realistic 3D content that could be linked to objects on the Web page. The technology was used to impart the undulating characteristics of water to the WaterLife Interactive site, McLaughlin said. And so, an interactive photo montage in the shape of the five giant bodies of water representing the Great Lakes is at the centre of the site. 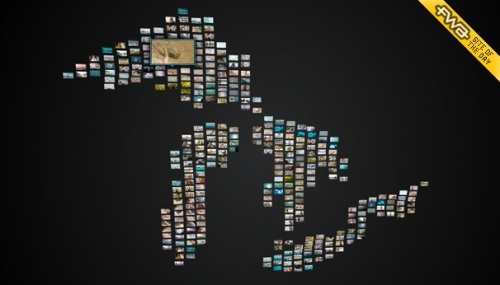 Each photo is a snapshot of what the lakes mean to the people and living creatures in the region. The thumbnail photos swell and sway as though they were schools of fish in the water. Click on a photo and it is enlarged. The images are connected to a rising and falling navigational ribbon at the bottom of the page and a row of topic buttons on the left hand side. Click on a button, a photo or the ribbon and photos, images, video and audio from the original movie are activated. McLaughlin said they wanted to boost audience reach but never expected the thumping reception the site would receive from diverse sources. WaterLife Interactive bagged the Best Interactive Arts and Best in Show awards from the Digital Marketing Association of Canada. The site was also awarded the City of Karlsruhe Prize at the BaKaFORUM 2010 TV and Media Forum in Karlsruhe, Germany, honouring the best educational, societal or science multimedia project. WaterLife Interactive also won the Activism award from South by Southwest Interactive Awards. Conventional wisdom would dictate that people probably do not have the patience to watch a movie on smart phone screens. The NFB iPhone app, however, is proving that assumption wrong, according to Deborah Drisdell, director general of accessibility and digital enterprises at the film board. Since it went live last October the app — developed by the NFB and Alamanga Tech of Montreal — has racked up impressive mobile traffic, she said. As of March 31, the application has been downloaded 225,000 times and no less than 720,000 instances of NFB films being viewed on the iPhone have been recorded. What’s more, the film board said NFB film viewing via online and mobile channels now has a 41 per cent completion rate. The application was developed mainly to open up the NFB’s vault of Canadian films to a new audience of mobile Web viewers. WATCH LATER – The app is useful even outside of Wi-Fi hotspots so you can load films to your iPhone for up to 42 hours of offline viewing. “We originally allowed caching of films for 24 hours but people began asking us to extend that, so we ended up with 42 hours,” said Drisdell. A key element of the strategy was to develop a user interface specifically for mobile phones. For example, the navigation buttons were designed to be much simpler and easier to access on a small screen. Drisdell said the NFB is now working on designs for an app that will be targeted at Apple iPad users. Apps for the BlackBerry and other phones, such as the Google Android, are also being considered.